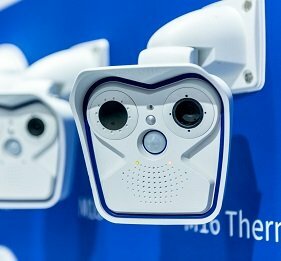 But if security cameras have long been a reliable means of catching people in the act of breaking and entering, the advent of IP surveillance means that criminals can now turn the tables on those who operate the cameras. They can ‘break and enter’ onto networks via the camera itself. In the video below, Sophos researcher James Lyne shows you how to hack a security camera. It’s alarmingly easy and should concentrate minds in the security industry – and that that applies to manufacturers, installers and CCTV operators alike. No wonder the cyber threat to CCTV systems has been in the news a lot recently. Last week around 1.5m IoT devices – mostly security cameras – were hijacked during a DDoS attack. And the BSIA CCTV section recently urged operators of IP-connected surveillance systems to do more to safeguard their systems against cyber attack, including changing the manufacturer’s default credentials. A Times investigation, meanwhile, reported concerns from MI6 about the threat to national security from IP-connected CCTV systems. In response to that story, Hanwha Techwin sought to reassure its customers that it was doing enough to repel attacks and called for collaboration across the supply chain. Watch how to hack a security camera. It’s alarmingly simple Sophos researcher James Lyne shows you how to hack a security camera. It's alarmingly easy and should concentrate minds in the security industry. It is against the privacy of people. So the people should be beware of these hacks. They should be given proper security by the companies who are dealing in camera industry. In fact, security cameras are most vulnerable because most of the people who deploy them don’t change their default username and password making it a cakewalk for hackers to hack them. of course. even without internet they can see through your clothes no matter how many layers you put on. poor man !!! Yep, and so many ways to do it. Reverse TV Lightwave Interpolation, Vulnerable devices with IR remotes can even see you in the dark! Then you got your older smoke detectors with radioactive elements misbehaving and broadcasting your movements through walls, Hell, even those LED light bulbs. I found a full suit of chainmail on Craigslist DarkWeb and I wear it whenever I leave the panic room. The issue identified following the Dyn DNS attack was that the CCTV cameras used in the DDoS attack had a root or admin user with a hardset password that can not be changed – not just that there was a default username and password. thank you for these tricks! can some one access to the camera without internet access? Apparently yes but first they let themselves in with software ! The leading manufacturer we use make you change the pass word and is has to be a high security one that you change it to. For easy recovery of photo or video on a website or you need to delete unwanted video or photo from a website and all hacking job such as , website hacking, emil, iphone, security camera and access control hacking, and bank hacking , to hire us please contact us by email: [email protected] and state what you want to do and we would help you ? Thanks for posting about home surveillance equipment that helps to give us full of security and protection. Ive worked for several it companies (huge ones too) and now i’m a hobbyist hacker. I can tell you when time pressure is an issue (which it always is) security is not an issue. (well fix it later, blame someone else). How can the average person protect themselves?? I am not tech savvy. Hello, Closed-circuit television (CCTV), also known as video surveillance, is the use of video cameras to transmit a signal to a specific place, on a limited set of monitors. It differs from broadcast television in that the signal is not openly transmitted, though it may employ point to point (P2P), point to multipoint (P2MP), or mesh wired or wireless links. We’re always interested in looking at the security of consumer and enterprise kit, whether it’s for a customer as part of a product security evaluation, or for our own interest. How can I protect myself. My home cameras are being hacked daily. I have to put covers over the lens. Can they still see me inside my home? Also, sometimes I caught them backing up footage and the most annoying thing is that they mute my alarm. One of my cameras is now defective and looks like a swarm of bees, unable to identify anyone in the frame. What can they be using and how can I protect myself and home? Thank you.